Click add to cart to see sale price. Single-Line Laser ScannerAutomatic Trigger72 Scan Lines per SecondIncludes Adjustable Stand110V Powe..
Single-Line Laser ScannerCodeGate TechnologyAutomatic Trigger72 Scan Lines per SecondIncludes Adjust..
Omni-directional Laser ScannerPrimary Omni-directional Scan PatternSecondary Single-Line Scan Patter..
Omni-directional Laser Scanner20 Scan Line Omni-directional Pattern1,120 Scan Lines Per Second ..
Omni-directional Laser ScannerOmni-directional / Single-Line Mode1,650 Scan Lines per SecondSleep Mo..
Wireless Single-Line Laser ScannerBluetooth Wireless Technology100 Scan Lines per Second Long B.. Spare set of C keys for the Sam4s ER-900, SPS-300 and SPS-500 Series Cash Registers. Includes .. 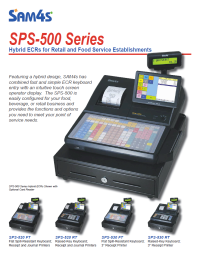 Spare set of P keys for the Sam4s ER-900, SPS-300 and SPS-500 Series Cash Registers. Includes .. Spare set of REG keys for the Sam4s ER-900, SPS-300 and SPS-500 Series Cash Registers. Include.. Spare set of VD keys for the Sam4s ER-900, SPS-300 and SPS-500 Series Cash Registers. Includes.. Spare set of Z keys for the Sam4s ER-900, SPS-300 and SPS-500 Series Cash Registers. Includes .. Copyright © 2015, JCR Systems, All Rights Reserved.